The Android platform's piracy issues makes iOS ZeptoLab's top priority. If Android wants to be a serious alternative to the iOS, it needs to deal with its piracy issues. So long as things remain as they are, ZeptoLab will make the iOS version of Cut the Rope, its sweet-chewing monster puzzle game, ZeptoLab's top priority for updates and extras. Though ZeptoLab acknowledges that many Android users who download pirated versions of their game do so unwittingly, it's still a major problem for this Russian developer. 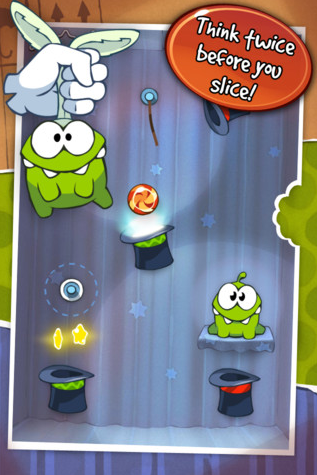 Cut the Rope is still available on Android, but its recent release Parachute Ninja is only available on the iStore. ZeptoLab thinks that most of its Android problems are down to unwitting pirates, people who want to buy the game but are directed to a pirated version when they search for it. ZeptoLab CEO Misha Lyalin calls this an "honest mistake" made by people who didn't realize that their search engine had led them astray. Android does deliver their app to thousands of new users, which Lyalin sees as a plus, but so long as piracy remains endemic on Android ZeptoLab will concentrate on the iOS version. Lyalin doesn't see how ZeptoLab can deal with the problem directly without ruining the play experience. "While we do try to take down most copycats and pirates," says Lyalin, "a lot of ways to protect our games would be not very user-friendly or won't meet our quality standards. Because the user is the most important piece of our puzzle, we generally choose to focus on adopting our business model - utilizing ads and in-app purchases - rather than taking on pirates."